Actress Katie Barberi ignited children’s imaginations with her spirited, comedic performance as Ursula in Nickelodoen’s hit show Every Witch Way, which recently concluded its first season. But this isn’t the first time she’s played the lovably mischievous witch on television. Based on the Nickelodeon Latin America series Grachi, written by Catharina Ledeboer, Every Witch Way is a nightly, telenovela-style show that follows two young rival witches – Emma (played by Paola Andino) and Maddie (played by Paris Smith). As the girls learn to harness their powers, they discover that there’s more to magic than meets the eye. Katie, who plays Maddie’s mother, first took on the role in the Spanish version of the series back in 2011. Although she was working on El fantasma de Elena and preparing to shoot Mi corazón insiste… en Lola Volcán for Telemundo, Katie found a way to fit Grachi into her busy acting schedule. As the first season of Grachi progressed, her character became more and more involved in the episodes. Gradually, Katie began to put her own spin on her character, giving Ursula a nasally, childlike voice with a cartoonish laugh. After three seasons of Grachi, the producers decided to launch an English version of the show on Nick. Though she had helped create her Spanish-speaking character and she already had a faithful fan following in the Latin American market, Katie was asked to re-audition for the English-speaking role. Of course, there was no one who could play the part better. And the rest, they say, is Hollywood history. Filmed in Miami, Florida, Every Witch Way may not have the budget for blockbuster special effects like other projects in its genre, but its recent place in the Top 5 downloads on iTunes proves it’s certainly not holding the show back. “There is no special effect like a child’s imagination,” Katie said. “They just run with it. If you believe what you’re doing, as an actor, if you really get behind the character, they run with it. And they believe it and then they encourage you, and they help you to believe it more, and you become kind of a team… I’ve always admired [Nickelodeon] immensely and I feel that programming for children is the most important programming on television, because it’s molding our young minds and giving them entertainment and it’s giving them escapism,” Katie said. Born in Saltillo, Mexico, Katie knew she wanted to become an actress at a very young age. When she was five, her mother was doing a theater performance of The Sound of Music in Mexico City and Katie begged to play the role of Gretl. Because of her age, the producers decided to choose an older actress, but Katie didn’t let it stop her from immersing herself in the role. At age 10, Katie moved with her mother to LA to pursue acting professionally. She eventually returned to Mexico and trained with the Academy award-winning diction coach Adriana Barraza (Babel), who prepared her for a career in telenovelas. Fluent in both English and Spanish, Katie has successfully built an international acting career. Her fan club, which call themselves the “Mariposas” (which means butterflies in Spanish), came about as a result of her role on Telemundo’s Doña Bárbara. Of course, her fans from around the world couldn’t be happier for Katie’s newest success on American television. “Every scene that I do, I try to walk on to the set, as tired as I am or whatever it is that’s going on in my life, and remember that somebody, somewhere in the world that I may never meet or even hear about, but somebody is going to benefit in some way from the opportunity that I’m being given right then to give a good performance. Even if it’s just to take that person out of whatever it is that’s upsetting them in reality and give them a chance to take a break for a little while and maybe watch somebody else’s problems or hopefully laugh at something my character says or does. It’s a huge responsibility. I don’t take it lightly.” Inspired by the devotion of her fan club, she created her jewelry line Mariposa Katie, which is hand-crafted and hand-painted with Swarovski crystals by Venezuelan jeweler Liza Schadan. The next day, Katie asked her mother to sketch the woman with wings that appeared in her dream. 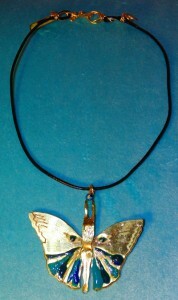 For more information on Katie Barberi’s jewelry visit mariposakatie.com. You can also follow her on Twitter at @KatieBarberi.